Have you ever had a troublesome .doc or .docx file Word that you can’t seem to open? Or even lost a document completely, with all your hard work gone with it? We’ve all been there before, and if you don’t already, this is a hard lesson that you should keep your computer backed up. There are plenty of free and cheap programs that will ensure this doesn’t happen in the future, so once you’re done with your work, do yourself a favor and set that up. 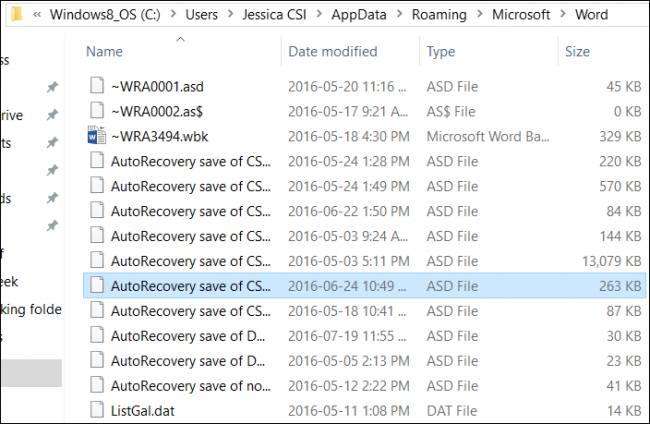 For the time being, here are a few ways to recover that lost or damaged file. “Word experienced an error trying to open the file. * Check the file permissions for the document or drive. Open Word, then click File > Open. From here, you’ll need to navigate to the file you’re trying to open. When you get to the file, select the “Recover Text from Any File (*. *)” file type from the dropdown menu. Click Open, and with a little luck, Word will recover your text. That being said, your mileage may vary. Sometimes the file may be corrupted beyond repair, and even if the text can be repaired, you may lose formatting. If the above option doesn’t work, Microsoft has another way to try to force Word to try to repair a file. In Word, click File on the Ribbon, and then click Open. In the Open dialog box, click to highlight your Word document. 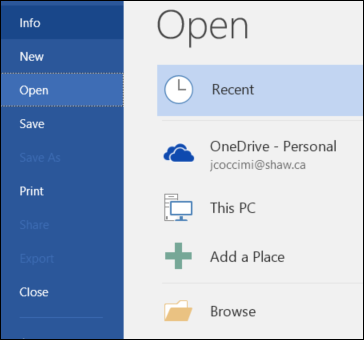 If you can’t even find the file, you may be able to find backup files that Word has saved. 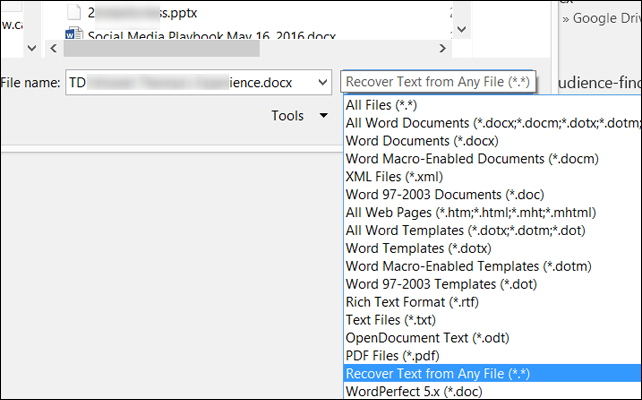 Here’s a demonstration of how to search for Word’s backup files in Microsoft Word 2016. Instructions for older versions of Word can be found in Microsoft’s documentation. After you’ve started Word 2016, first click File > Open. Then navigate to the folder where you last saved the missing file. In the Files of type list (All Word documents), click All Files. The backup file usually has the name “Backup of” followed by the name of the missing file. Click the backup file, and then click Open. If you don’t find the backup file listed that way, alternatively search for *.wbk Word Backup files. The name of the file may be unfamiliar, since it’s automatically generated by Word. So, if you see any .wbk files, open them one at a time until you find the one you’re looking for, and save it right away. “C:\ Documents and Settings\<username>\Application Data\Microsoft\Word”. I found mine stored in C:\Users\<username>\AppData\Roaming\Microsoft\Word. An auto recovery file that is complete will have the extension of .wbk. If you’re having trouble finding your Autosave storage or Temp files folder, a fast and easy way to find your autosave files is to use the Search Everything utility to search for filetypes like “.asd” or prefixes like “wra”. You’ll need to wait for it to index your computer’s storage, but after it’s done, it’s lightning quick. Hopefully, one of these options will help recover your lost work.